President Millard Fillmore commissioned Perry in 1852 to lead a naval expedition to persuade Japan to open diplomatic relations with the United States. Perry concluded that the only way to end Japanese isolationism was to intimidate the government with a display of naval force. 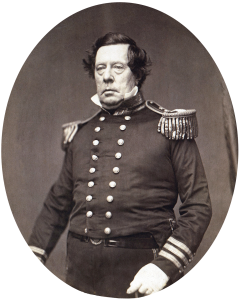 Accordingly, he boldly sailed into fortified Uraga harbor on July 8, 1853, and effectively extorted a treaty. This ushered the United States onto an equal footing with Britain, France, and Russia in the economic exploitation of Asia.